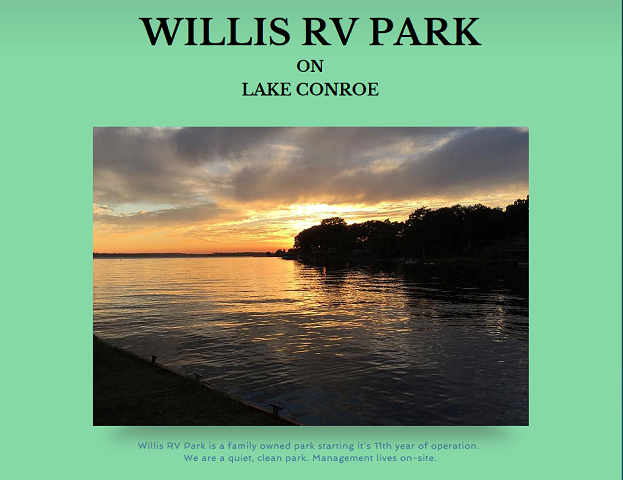 Willis RV Park & Storage is a family owned establishment in Willis, Texas. Since starting this business 11 years ago, we have made a lot of improvements, and are working hard to continue that progress. We currently have 56 sites, climate controlled storage units, and are working on 9 weekly-stay cabins. We are located in a rural setting right on Lake Conroe for that “get out of town” feeling, but close enough to Conroe to have the conveniences of bigger cities. We strive to keep our grounds safe, clean, and fun for your enjoyment, and we are committed to helping you feel comfortable here at our park. At Willis RV Park, we have the best rates on the lake, great fishing, with kindhearted staff and residents. We hope you choose our resort for your next weekend getaway, holiday vacation, or your new home! We also offer monthly storage unit rentals. Please check the “Storage” tab. Call for availability. COMING SOON – Fully furnished, all inclusive cabins for weekly rental!